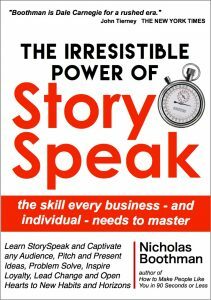 From a world renowned expert on face-to-face communication, with over 3 million books in print in more than 30 languages, comes The Irresistible Power of StorySpeak, the trust-inducing ability to strategically change attitudes and behaviors, and forge emotional connections in as little as 30 seconds. When Warren Buffett, the second richest man in the US and holder of the unofficial title “America’s Greatest StorySpeaker” was asked, “Do you enjoy your work?” He replied, “I tap-dance to work.” That’s StorySpeak. Martin Luther King Jr’s “I have a Dream” speech was delivered in StorySpeak, as was Steve Jobs’ legendary Stanford commencement speech in 2005. Queen Elizabeth the first inspired her troops to victory in 1588 with her “I have the body of a woman; but the heart and stomach of a king” speech. StorySpeak brings brands to life, strengthens marketing impact and forms the foundation of all growth strategies. The names PayPal, Apple and Windows are all StorySpeak. Mohammed Ali’s “float like a butterfly, sting like a bee” is StorySpeak too. Almost every successful book, movie or song ever written relies on StorySpeak to connect with the emotions as does every riveting conversation, presentation and speech. In 1975, two screenwriters walked into a Hollywood producer’s office and said three words, “jaws in space,” and the blockbuster movie Alien was born. Pure StorySpeak. Great communicators, since the beginning of time, have used StorySpeak to change attitudes and behaviors, rally and inspire loyalty, and fire up the imagination – in as little as 30 seconds. Kindle edition available August 1st, 2017 – Pre-order here. Download the free Kindle app to read on any device. Nicholas, Thank YOU for another gift of yours!!!! I am currently in Greece and I will not be able to get your book for a while. I also do not have Kindle. It is at the top on my list to get when I come back to Canada. where do I find it? Do you do any live presentations on it?